We have a dedicated team who can help you to project manage larger or more complex Corian® or Solid Surface projects. 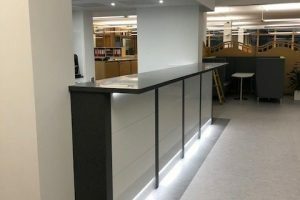 Counter Production have a dedicated team who can help you to project manage your commercial corian worktop installation projects and large solid surface projects from start to finish. Recent projects include 120 high-end kitchens in South London for Porcelanosa Group, 27 bespoke kitchens on a 6 week turnabout and 100 flats in Cambridge. These required exacting schedule tracking to make sure the main contractor incurred no over-run fees. 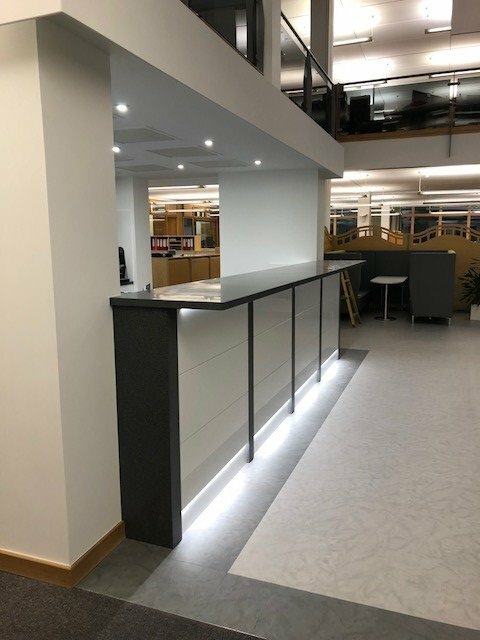 As well as larger scale installations, we also work on smaller installations such as design, build and installation of 7 bathroom troughs for schools and a number of tables for Heathrow T5. Counter Production have comprehensive Health & Safety processes, Methods of work and thorough Risk Assessments are recorded for all site work, backed up with an industry leading cloud based scheduling platform. From initial quotation, our estimator is available to discuss in detail what your requirements are so that you get the right price for the work you are tendering for. Upon acceptance we will visit the site and work with you on your schedule of works to make sure that templating, delivery and installation fits around your timetable and other trades. Your contact will work closely with you throughout the project, reacting where needed to the changes that larger scale projects often involve. With dedicated fitting teams kept on projects, you can rest assured the project will run on time and on budget, whilst maintaining continuity at all times. In a recent survey, 85% of our customers indicated that communication and professionalism was at the core of our values when dealing with Counter Production Ltd.
All of our Fitting teams are CSCS registered and always carry full PPE. 110v equipment is PAT tested every 3 months to comply with the most rigorous of site conditions.